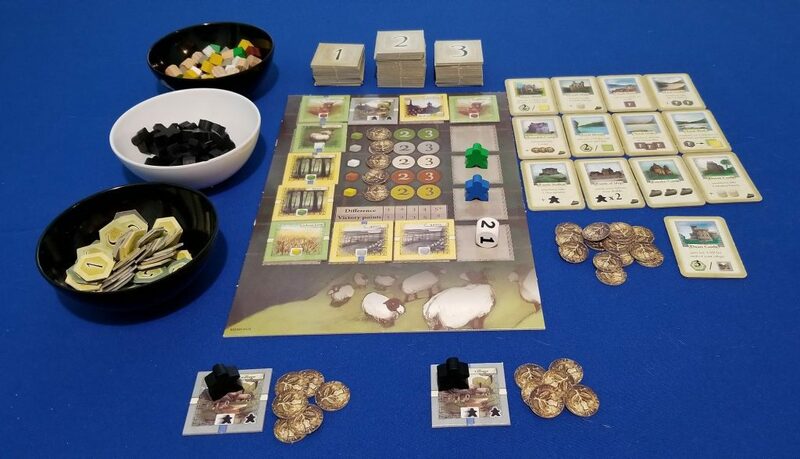 In Glen More, each player takes on the role of the leader of a 17th century Scottish Clan as they work to expand their holdings and increase their wealth. The main action in the game takes place on a rondel that sits in-between the players. At the start of the game, this rondel is loaded up with tiles that the players will be adding to their demesnes. As these tiles are added, they will produce goods which will be needed to purchase future tiles and/or utilized by other tiles in order to score the players victory points. Movement along the rondel is tricky though. If you leap too far ahead of your opponents in order to grab up a tile that you really desperately want, they might have the opportunity to perform multiple actions in a row because their turn doesn’t come to an end until after they have surpassed you. As if that weren’t enough to think about, the scoring in Glen More can be tricky as well because each scoring phase will ask each player to compare their standings in certain criteria to the opponent that is the lowest in that criteria and then score based on the difference in the two values. After three scoring phases a final scoring is completed and then the game comes to an end. The player with the most victory points wins. First, the game board containing the rondel is placed within easy reach of all the players. Then the tiles are sorted according to the numbers on their backs into four piles which are then shuffled separately. These piles are kept face down close by. After selecting a start player, each player selects a color and then takes turns placing their player pieces, one in front of the other, on the rondel spaces. This creates a “chain” with the starting player’s piece at the end of the line. In a 2 or 3 player game, a die will be placed into the final position as in the following image. During the course of the game, this die will be rolled and moved to randomly remove tiles from the rondel. Then, beginning with the stack of 0 tiles, tiles are drawn and placed onto the rondel. The first is placed at the end of the chain with each subsequent tile placed into the next empty spot. Once the space before the start player is reached, no more tiles are placed. There will always be a gap between the last tile and the beginning of the chain as illustrated in the previous image. 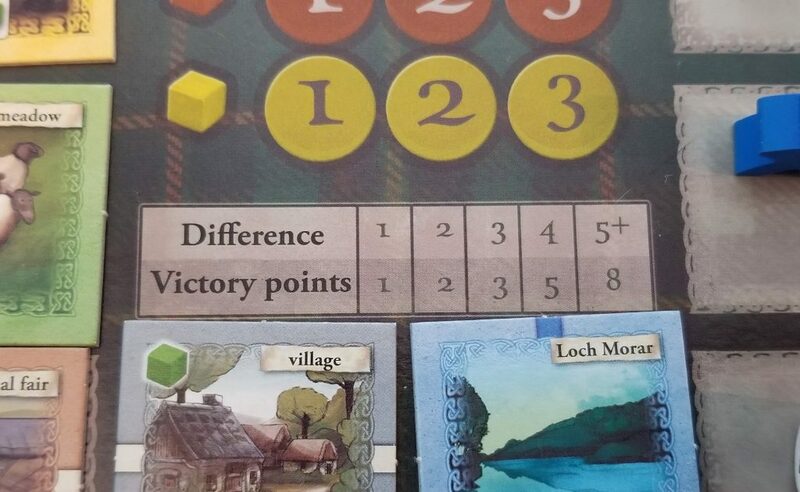 Next, each player receives a starting village tile, a single clansman, and 6 coin. The remaining items – resource cubes, victory point tokens, extra clansmen, and special location cards – are placed into a general supply nearby and you are ready to begin playing Glen More. If green chooses to take tile #1, they must pay the requisite cubes shown in the upper left hand corner of the tile. Then, since this is a road tile, it is placed into green’s demesne in such a way that it continues another road tile. This placement would then cause the surrounding tiles to activate (which we’ll discuss next). If, after this tile acquisition and placement, green is still at the beginning of the chain, they may move their worker and collect another tile. This continues until green passes another player’s worker at which time a cleanup is performed wherein any tiles that green passed up are removed and new tiles are drawn and placed to refill the board. Then it is the blue player’s turn since they are now farthest behind on the track. Each tile in Glen More performs some kind of special function. Some produce resources. Some provide the player with extra clansmen. Some allow the player to return resources for victory points. Regardless of what the tiles do, they don’t do anything until they are activated by having another tile placed into the demesne next to them in any cardinal direction. Then the player can handle those tiles in any order that they wish utilizing the proceeds from one to score with the other, for example. Use the movement provided by the village tile to turn one of their clansmen into a chieftain. It is removed from play and kept in their general supply. This will be used during scoring. There are four different scorings that occur throughout the game. One scoring occurs after the stack of 1 tiles has run out. Then additional scorings occur when the stack of 2 and 3 tiles run out. After the third scoring an end of game scoring is completed and the person with the highest end score wins the game. 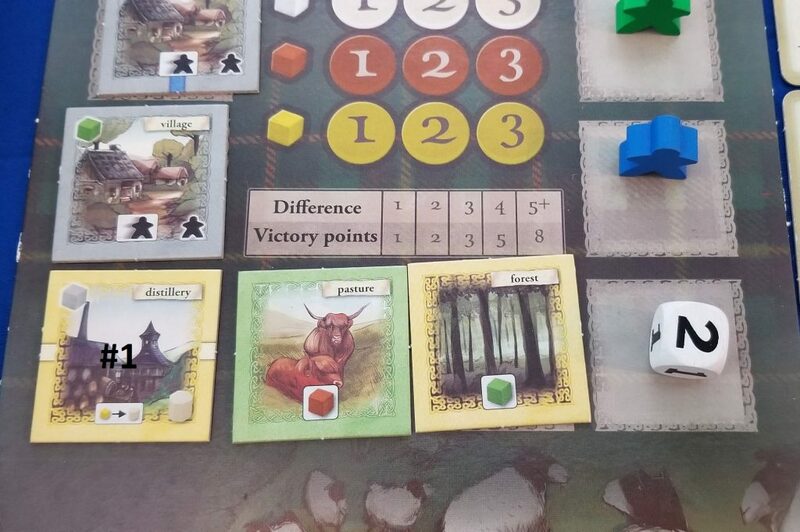 For the first three scorings, several things are considered – chieftains, special location cards (collected when placing special location tiles into your demesne), and whisky barrels. With each of these considerations, every player will compare their total with the total of the person who has the lowest amount in that category. For instance, if player A has 5 whisky barrels and player B only has 1, there is a difference of 4. Then, each player scores points based on this difference. In the previous example, when scoring whisky barrels, player B would score 5 points because of the 4 point difference. In the final scoring players score points from certain special locations, 1 point from each of their coins, and then they compare their total number of tiles to the person with the fewest. For each point of difference, they lose 3 points. So, if player A ends the game with 12 tiles and player B ends the game with 14, player B will lose 6 points (14-12 = 2 points of difference). When it comes to visuals, Glen More isn’t going to be winning any contests anytime soon. The colors are dark and dreary and the artwork on the different tiles and special location cards isn’t anything special. Yes, they’re drawn well, but they feel pretty rote. No, if I had just walked into a store and seen this game sitting on a shelf, nothing about its outward appearance would have enticed me to pick it up, much less consider buying it. The only reason that I even own the game is that I have been collecting the Alea bookshelf games for some time and Glen More was one that I needed to fill in a gap in the set. Even when I got it home and cracked the lid on the box, I was underwhelmed. The various bits and pieces are of pretty low quality. Nothing about my first impression of Glen More instilled any confidence in me about my purchase. But, man, am I ever glad that I did because Glen More has easily become one of my favorite games. It’s hard to put my finger on just what it is about Glen More that makes it such a fantastic game. Part of it is the weird scoring system. Most games award you based on how much of a specific thing that you have and, generally, the more that you have the better off you’ll be. Glen More, on the other hand, rewards efficiency above anything else. You always want to be ahead of your opponents, but not by too much lest it hurt you in the end. After all, it doesn’t matter if you’re scoring consistently higher during the regular scoring phases if your sprawling play area causes you to lose that advantage at the end of the game. Part of the draw of this game is also the manipulation of the rondel. This coupled with the aforementioned scoring system makes you have to carefully consider each movement along the rondel. Move too far to pick up a tile that you really want and you leave a lot of openings for your opponent. However, not picking up that tile is also risky as your opponent might be after the same thing. Feeling out what your opponents are doing or are likely to do and measuring that against what you’re personally wanting to accomplish is like playing a clever game of cat and mouse. Your rondel movement could also result in a scoring. Move too far and you might force a scoring when you’re in a particularly bad position. Or the opposite may be true. Maybe you’re in a great position and want to force a scoring while the outcome is beneficial to you. The other aspect of the game that I really like is how the placement of the tiles into your display causes the tiles around them to activate. This welcomes a bit of action planning into the game. For instance, maybe you see a distillery coming up in the display, so you decide you want to generate a lot of wheat. However, you can’t place the tile in such a way to activate the wheat as there isn’t a clansman next to the tile. 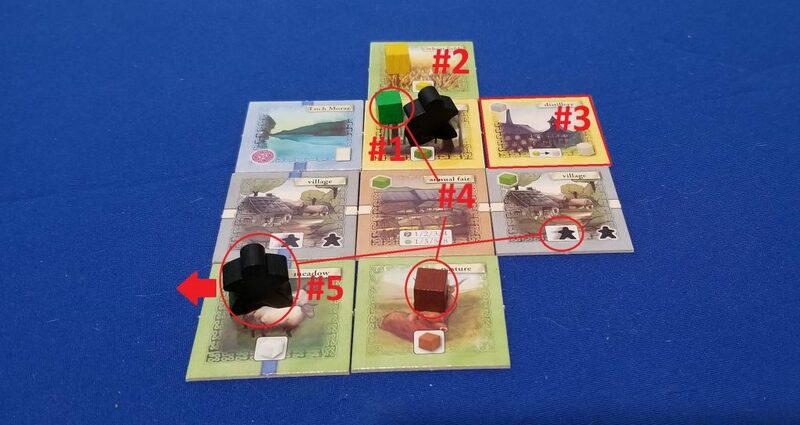 Your best bet would be to place a tile next to a village so that your clansman will be in position to allow the placement of your distillery and also generate wheat at the same time. In this case, not only will your conundrum dictate where your future tiles get placed, but it will also help to shape your plan for the next rondel phase. Aside from Glen More’s lackluster appearance, I have nothing but praise to heap upon the game. It’s just a brilliant design that is deceptively easy on the surface, but jam-packed with difficult choices and opportunities for tactical decision making once you dig into it. The role of luck is present in the randomness of the tile draw, but it plays an almost negligible role here. It’s just a lot of fun. Easy to set up, easy to teach, but challenging to play, Glen More is a game that’s sure to please. Definitely give this one a chance!